Chicks need to feed a lot in their first few months and longer trips looking for food means less food for the chicks. Due to lack of food, growing interference from humans and the presence of predators, the population of Galapagos penguins is on a decline and they are considered as endangered. The Galapagos Islands are part of an archipelago of islands, and the penguins are found various islands in the archipelago. Along with penguins, there are several other kinds of wildlife and marine life on these islands which can make hunting for food a competition between different species. As Galapagos penguins prefer the cold waters, they hunt for food during the day and close to their breeding site. Penguins are dependent on the cool ocean currents to bring them the kind of fish that they prefer to eat. The Humboldt Current brings cool waters to the shores near the breeding sites of the penguins. The Cromwell current brings cool waters up from the depths of the sea to make the shores hospitable for the penguins. 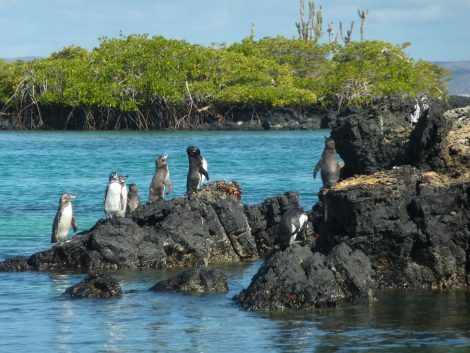 On these islands, Galapagos penguins mostly eat fish, krill and other crustaceans. The penguins hunt for prey by swimming in groups and either take their prey from below or the sides. Let’s take a quick look at all the sea creatures that form a part of the diet of penguins. Mullet – Mullets are small fish that swim in large schools that makes it easier for Galapagos penguins to catch these fish. Penguins often hunt in groups and they corner the fish so that they can catch the fish that are on the outside of the school. Mullets have a tendency to jump out of the water which also makes it easier for penguins to spot the school of fish and swim to that location to catch them. Sardines – Sardines are one of the pelagic fish species that swim together in large numbers. Because of their large numbers, it is easier for penguins to catch these fish and they can hunt these fish with ease near the water’s surface. Under the surface, penguins are adept swimmers and they can chase the fish with great speed and agility. Anchovies – The anchovies are small fish of Engraulidae family and they are found in the cold waters near the Galapagos islands. This fish is the favorite food of the Galapagos penguins and it is rich in nutrients and vitamins that can help the young penguins in getting all the nourishment from the fish. If there is a lack of anchovies because of excessive fishing, Galapagos penguins change their dietary preference to sardines. Crustaceans – There are different types of crustaceans that are favored by Galapagos penguins when there is a lack of fish around their rookeries. 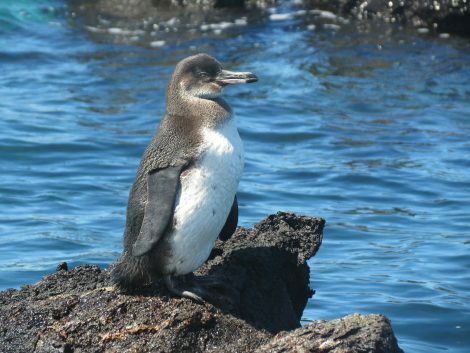 Galapagos Penguins dive deep in the ocean as far as 50m or look for crustaceans near the shore. Galapagos penguins are quick in the water, and they can swim fast to their desired prey and quickly grab it in their beaks. They often feed on small squid and krill which makes up for a significant portion of their diet. Galapagos penguins are small and nimble in the sea, and they need their daily dose of nourishment from the various sea creatures they hunt. When they are rearing their chicks, the penguins eat even more leading to a shortage of food near their rookeries. In those times, the penguins swim farther from their nesting sites to look for fish. If you have been curious about what do Galapagos penguins eat, now you know the answer. They eat different kinds of small fish that they swallow whole and digest in their stomach. Penguins also feed their chicks with a regurgitated mixture of the fish and oils from their body which is highly nourishing and helps the chicks grow quickly. If you have any questions or queries about what do Galapagos penguins eat, feel free to get in touch with us through the comment section below this article. Our team would love to answer any questions you might have about penguins.